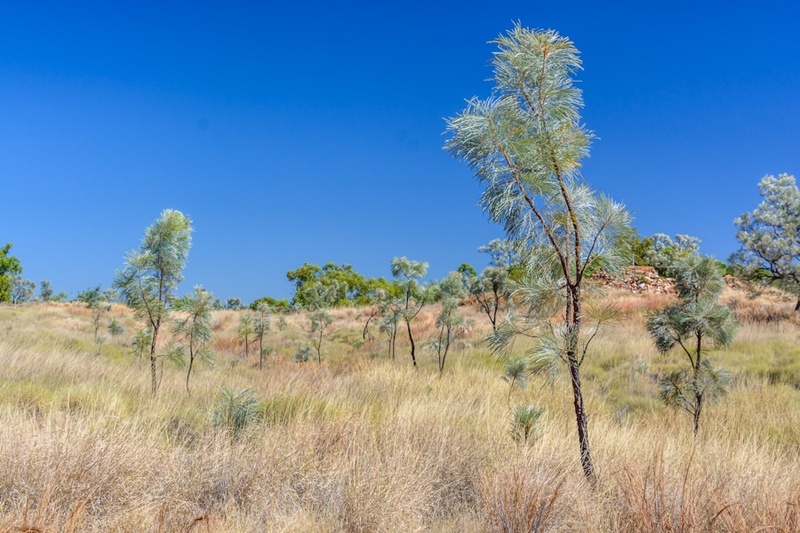 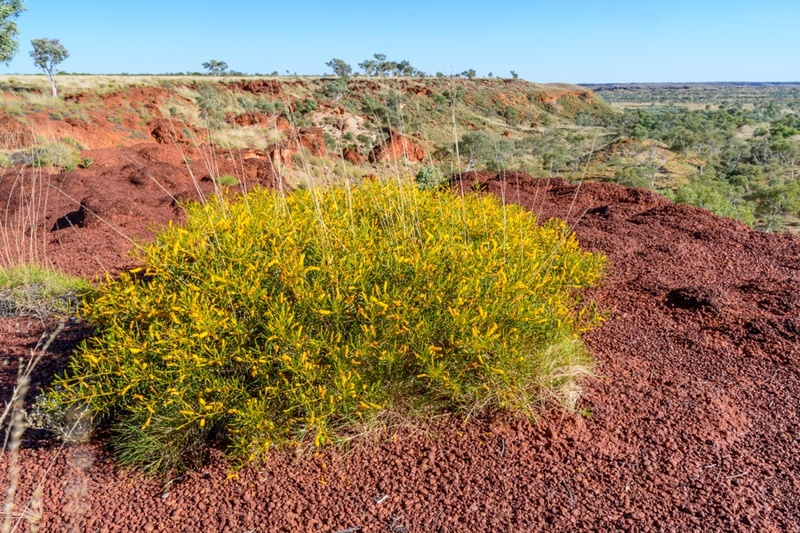 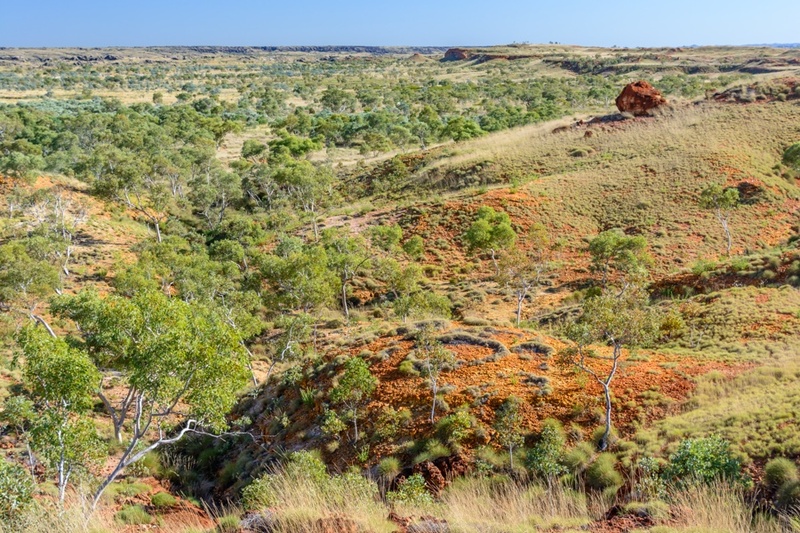 The Kimberly region occupies the northernmost part of Western Australia and is dominated by a vast Savannah, sometimes interrupted by more than evident traces of an ancient Devonian coral reef, dated back to nearly 400 million of years ago. 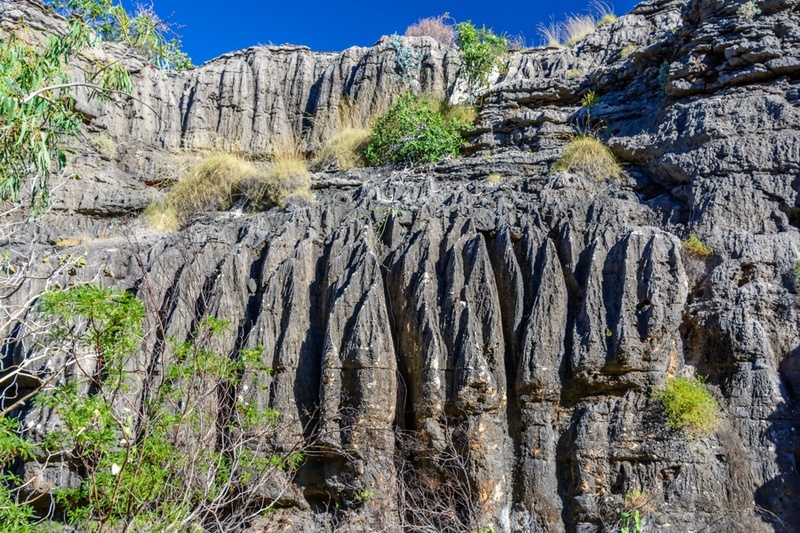 Once the floor of an ocean, the Devonian reef now lies in the middle of a continent, attracting visitors for the beautiful landscape and for the interesting geology. 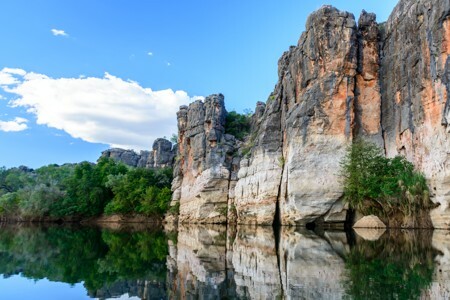 How to get to Kimberly? 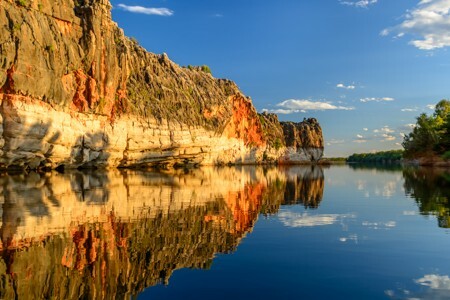 The Kimberly region is located in the northernmost part of Western Australia and the main gateways are Broome, connected with several flights per day to Perth, and Darwin (NT) having also direct international flights. Moving around in the Kimberly is far to be fast or easy, as the region is huge and the environment extreme year-round. 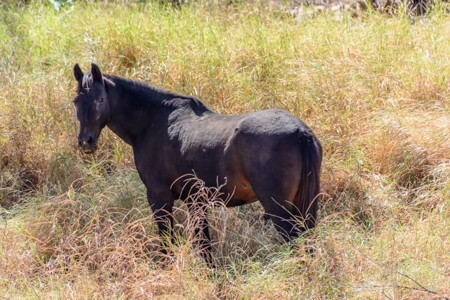 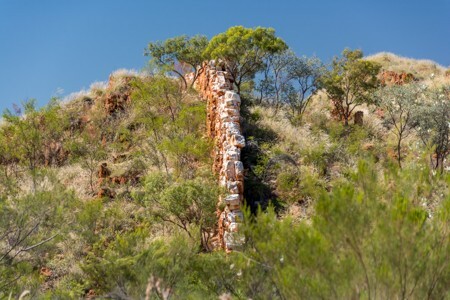 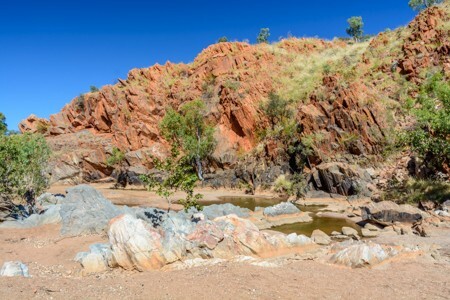 Organized tours lasting from 5 to 12 or more days are offered by several operators using all-terrain vehicles, exploring the region either along the only highway, or along the Gibb River road (an unsealed track in the middle of nowhere). 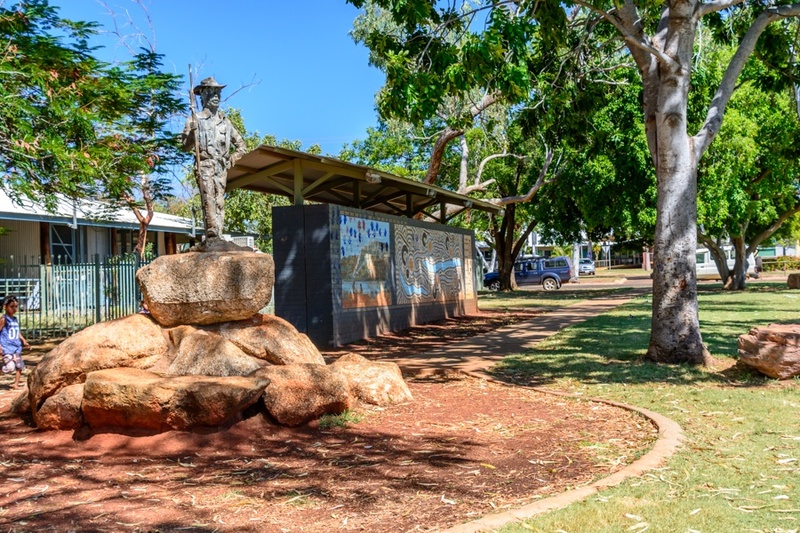 Itineraries can be chosen among loop tours from Broome to Broome or Darwin to Darwin, while others are just one way tours from Broome to Darwin or from Darwin to Broome. 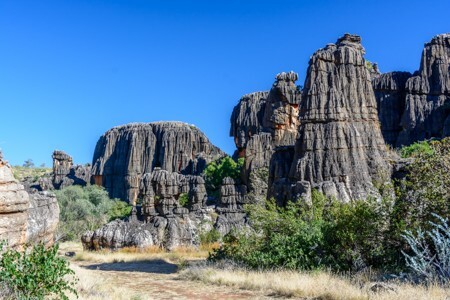 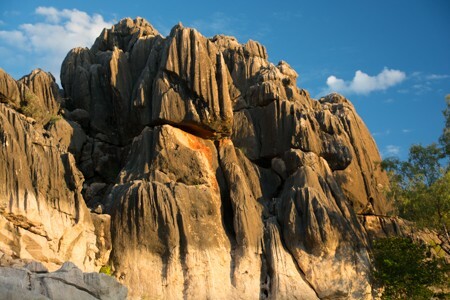 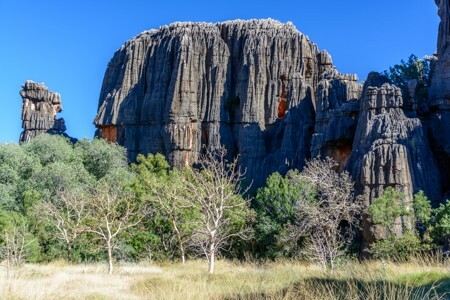 Most of the Kimberly region is a Savannah dotted with thousands of termite-mounds and the only season suitable for exploring is the southern winter, as summers see hot temperatures and heavy rain falls. 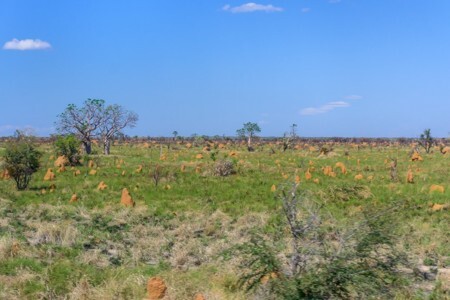 Kimberly's typical vegetation includes baobabs, a native tree of the African continent: the why this tree is present in Australia, is a reason for debate among botanists. 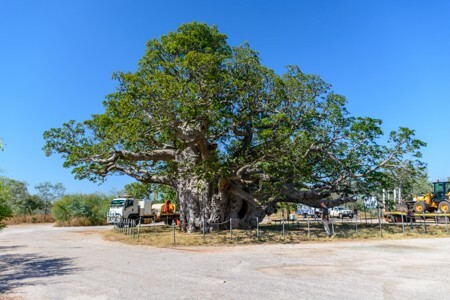 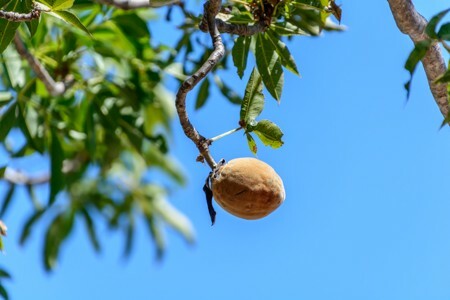 Some say that baobab has arrived in Australia some millennium ago through seeds transported by some vectors, while others claim that the tree existed when Africa and Australia were still part of a single large continent (Pangea) and therefore sharing most species. Australian Savannah in the Kimberly region. 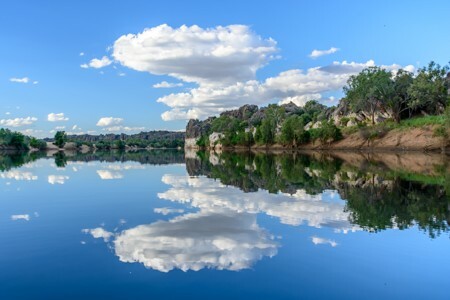 The trip took place during the second half of May, the transition season between summer and winter and the best time to visit the Kimberly, when there are still many flowers and the vegetation is partially green due to the heavy rainfall occurred during the wet season (November to early April). Kimberly's geology is fascinating. During Devonian period, around 400 million years ago, the Geikie Gorge was just a coral reef on the ocean's floor, now located in the heart of the mainland, over 200 kilometers from the nearest coast and 150 meters above sea level. 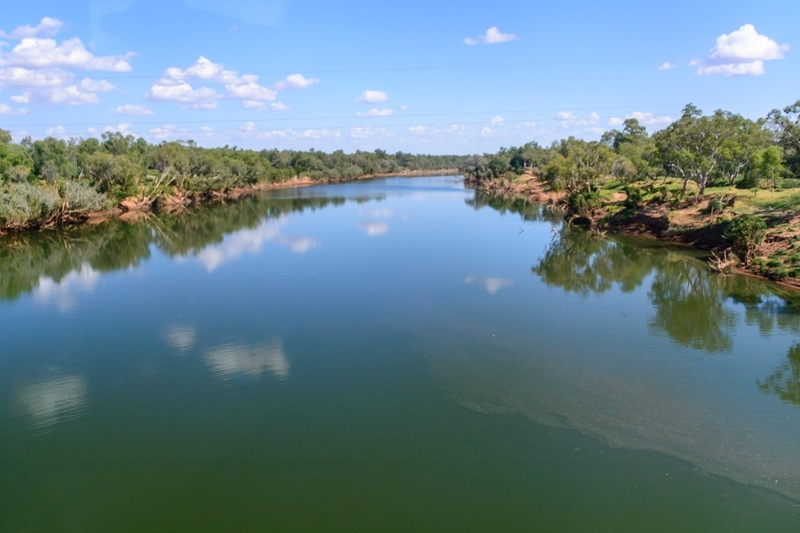 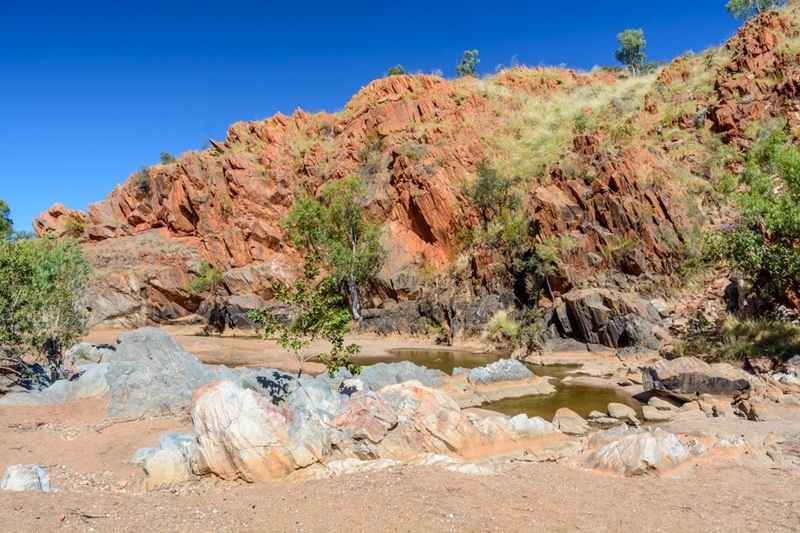 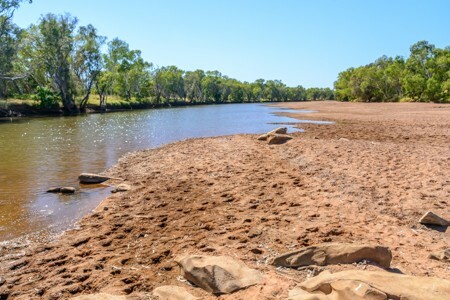 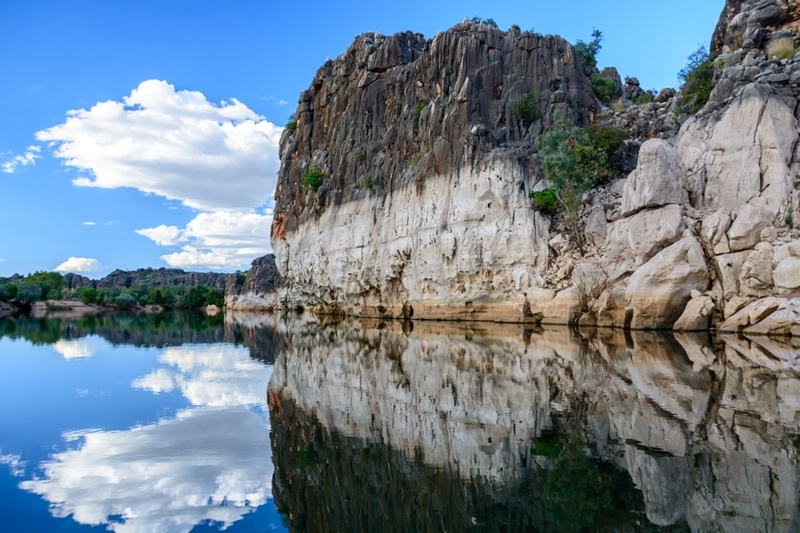 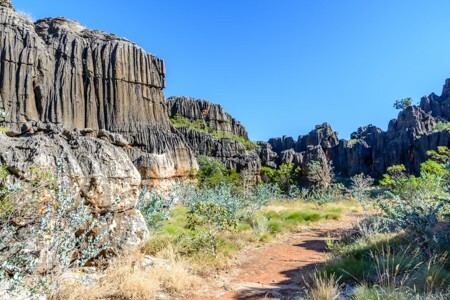 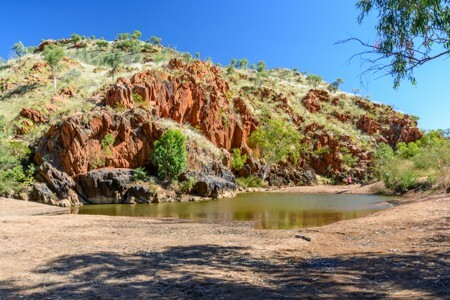 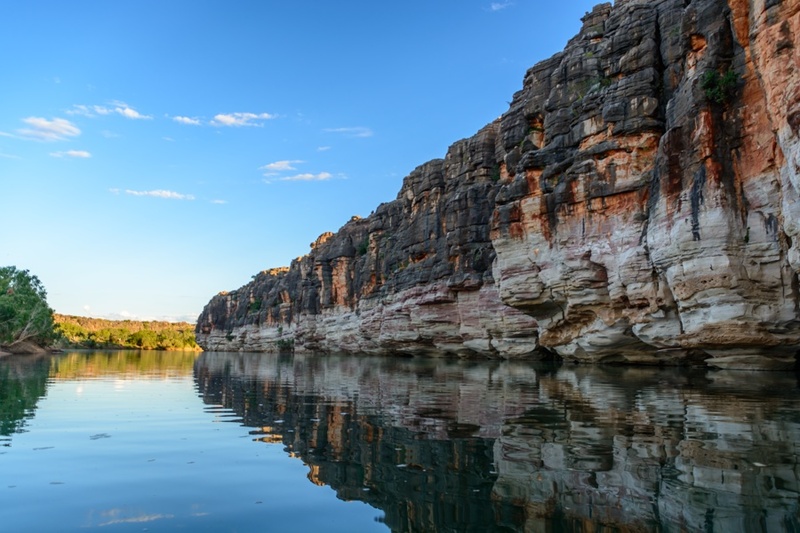 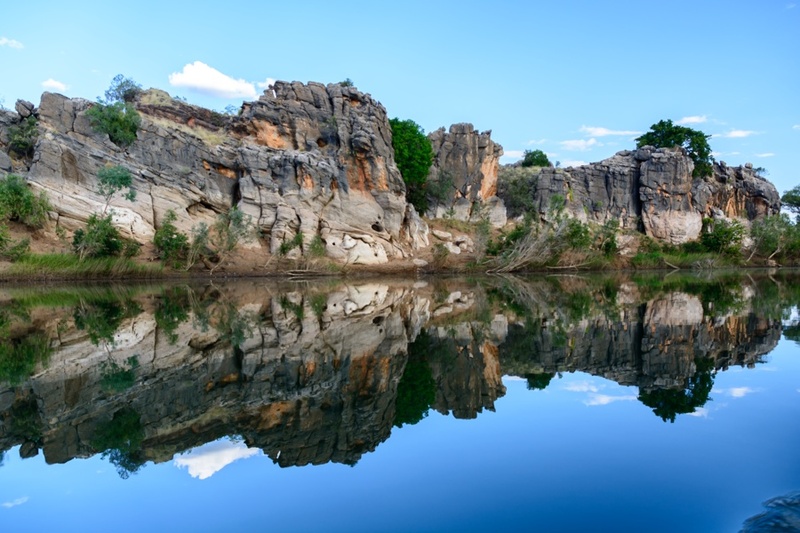 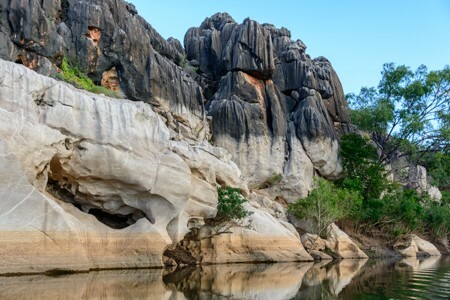 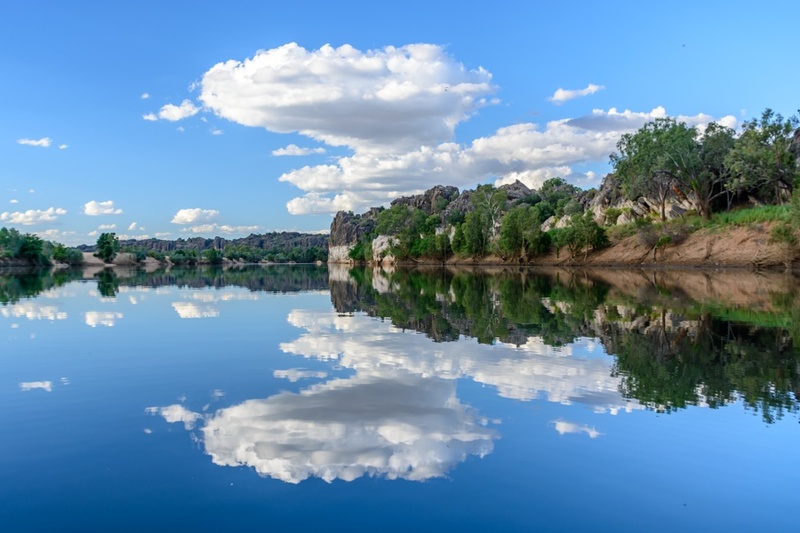 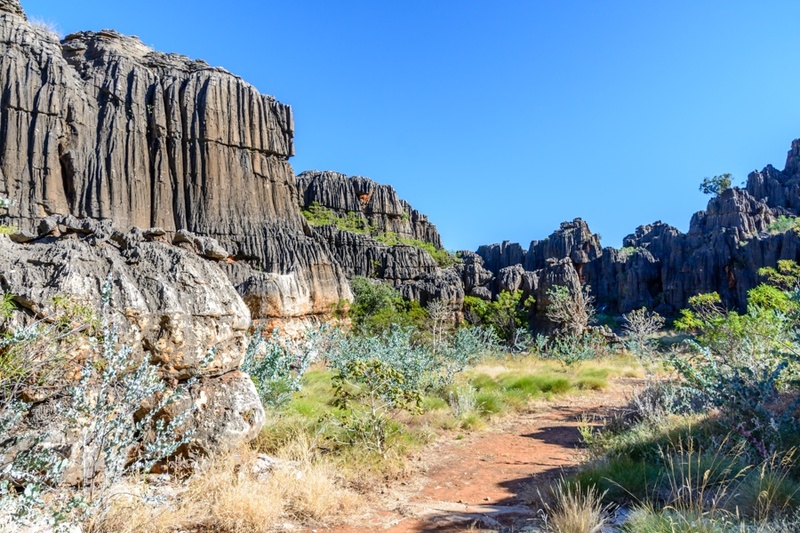 Geikie Gorge is located near the town of Fitzroy Crossing and a cruise along Fitzroy River allows visitors to have a look at this unusual landscape, which resembles more a raised atoll, rather than a Savannah in the middle of a continent. 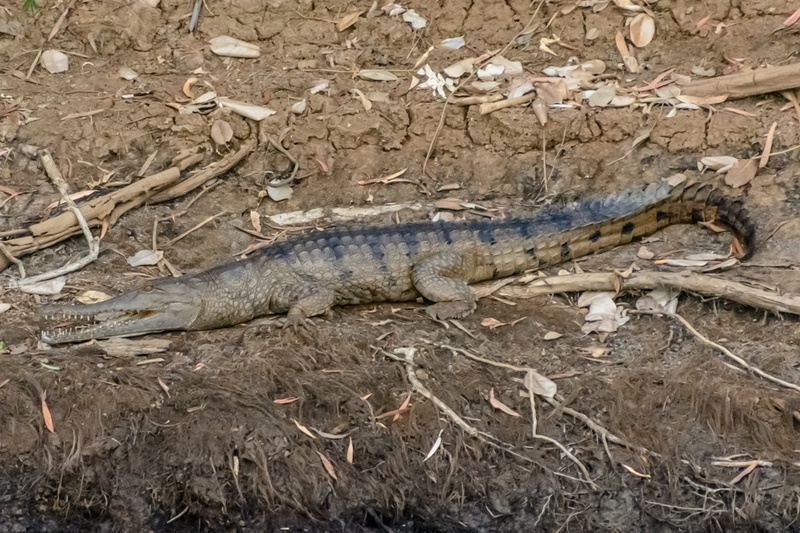 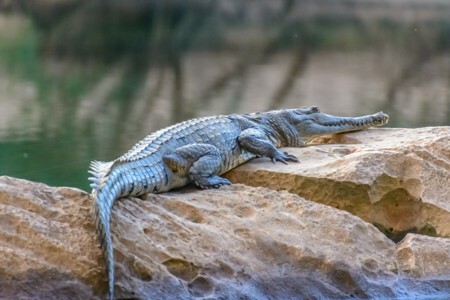 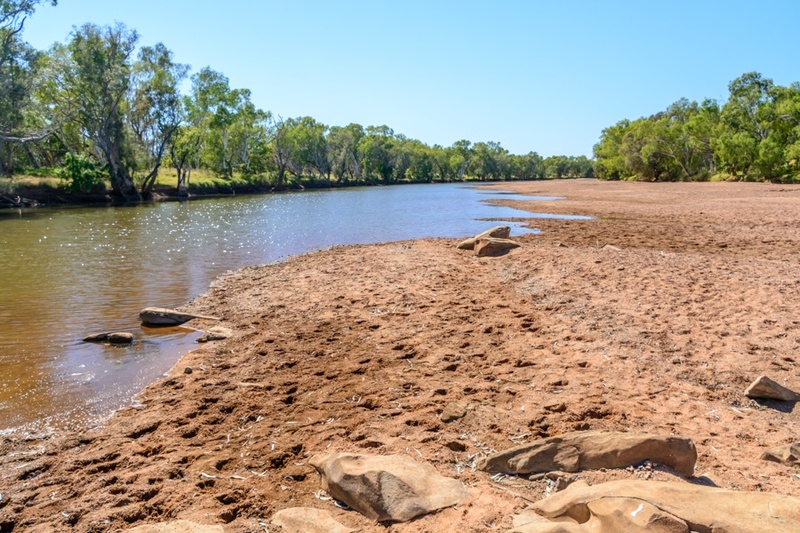 The Fitzroy River is home to many freshwater crocodiles. 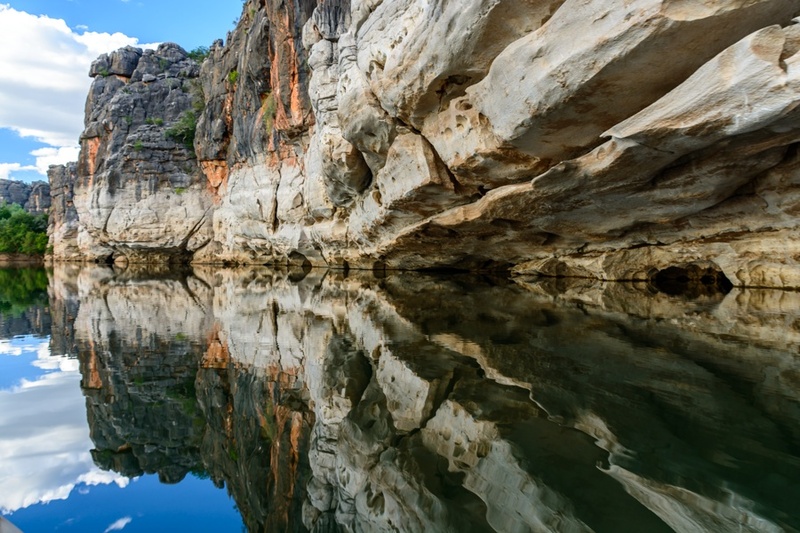 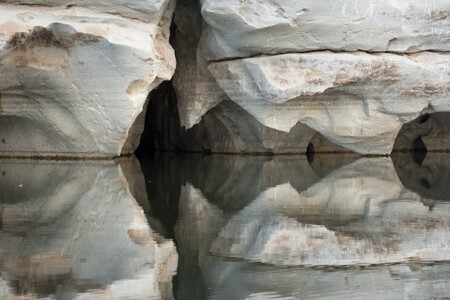 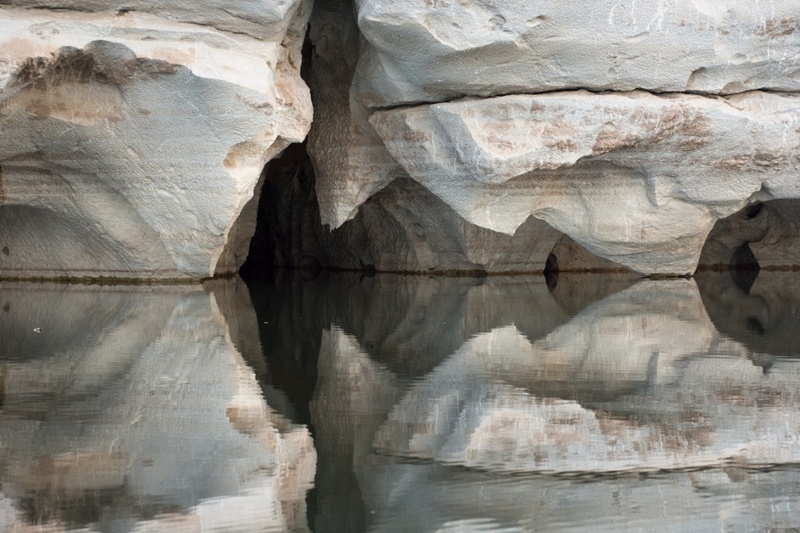 More photos of the Devonian reef at Geikie Gorge near Fitzroy Crossing, reflected in the calm waters of Fitzroy River. 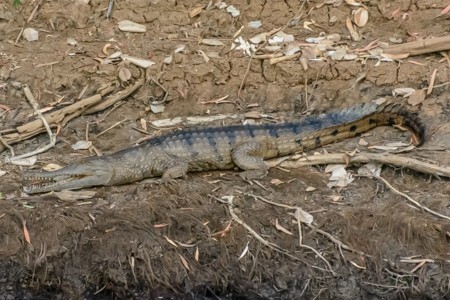 Along the banks, there are lot of crocodiles. 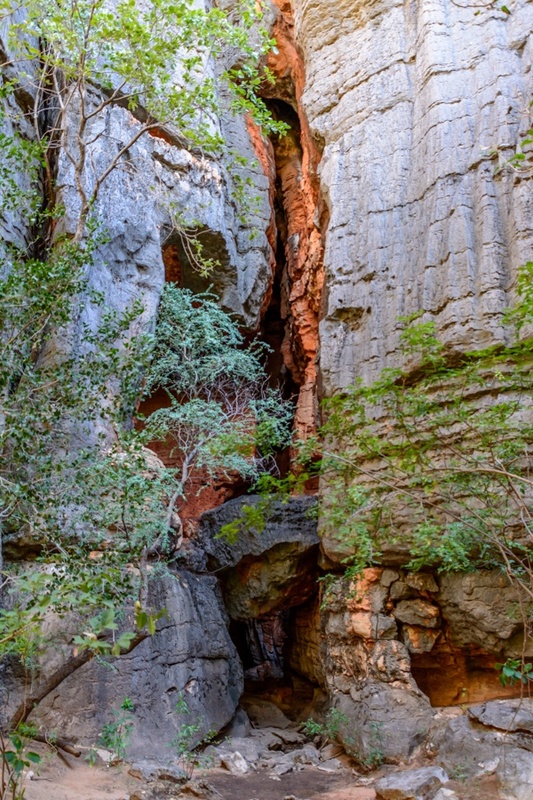 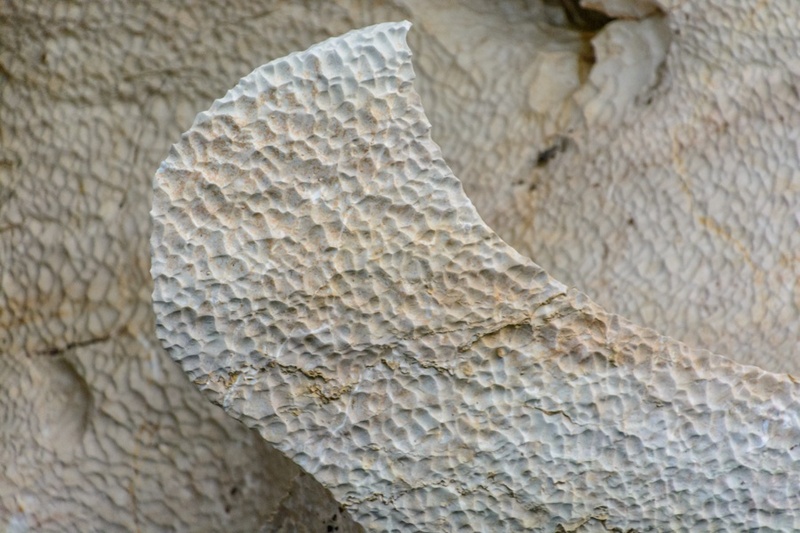 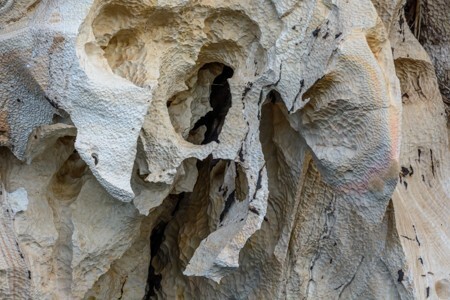 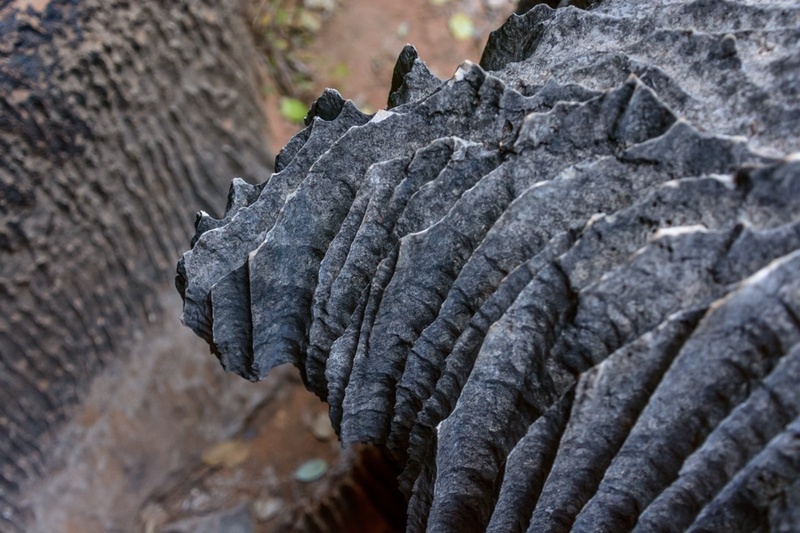 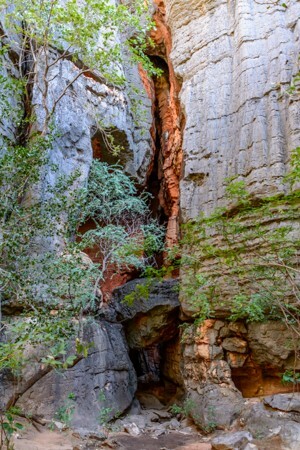 Looking closely at the rocks of Geikie Gorge, visitors can not miss the patterns showing fossilized corals from Devonian era, when this gorge was under the ocean. 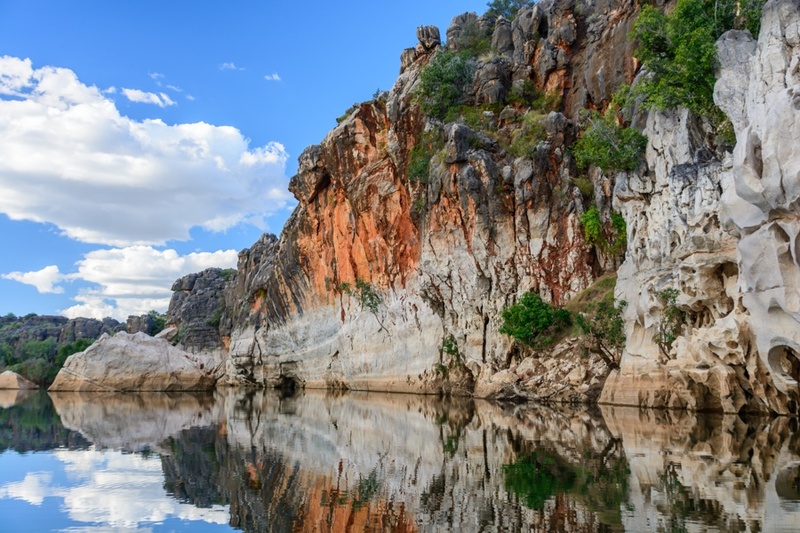 Geikie Gorge illuminated by the warm sunset light. 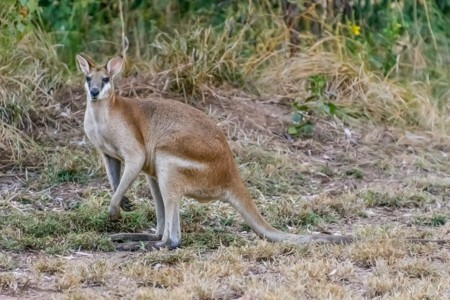 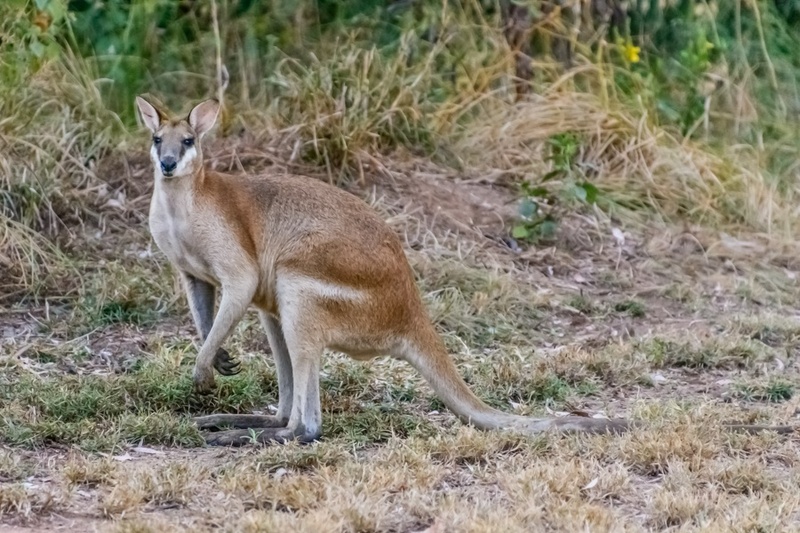 In the Kimberly, it is not unusual to spot the wallaby, a marsupial that resembles a miniature kangaroo: its length never exceeds 120 centimeters. 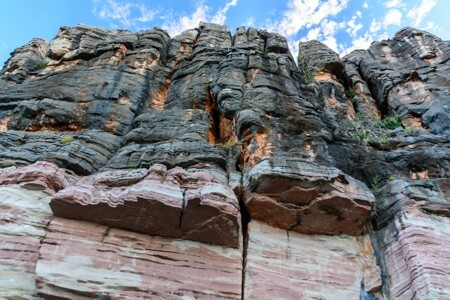 The Great China Wall in Australia. 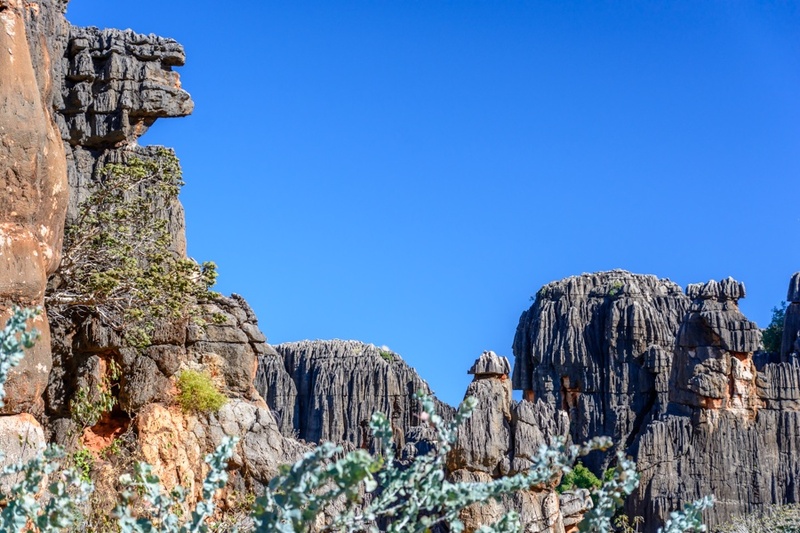 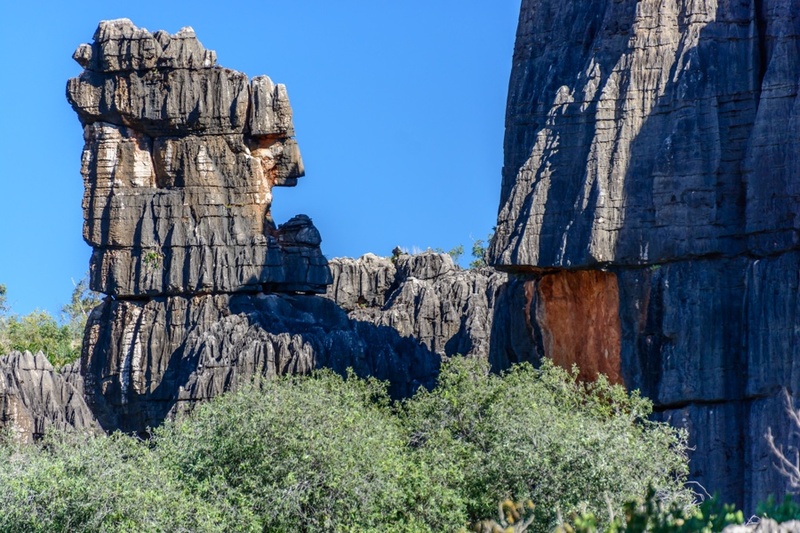 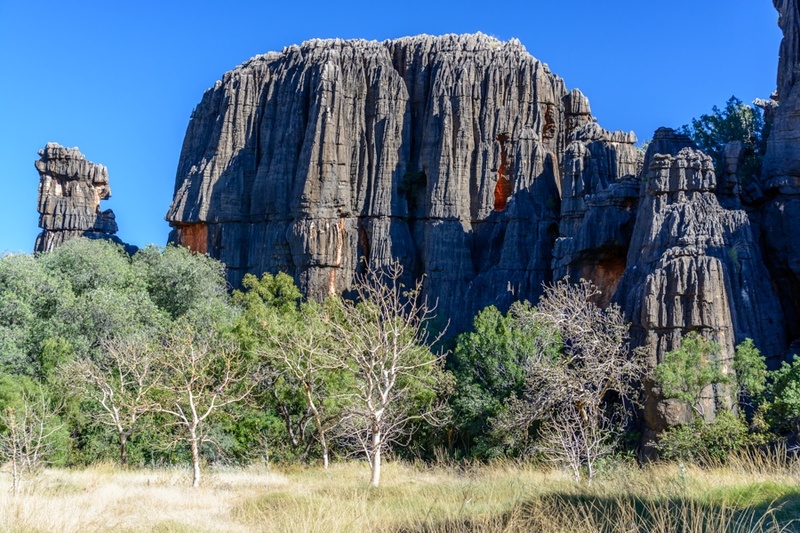 This curious rock formation is located about 6km from the town of Halls Creek, in the heart of Kimberly, and is so called because it reminds the big sister in China. 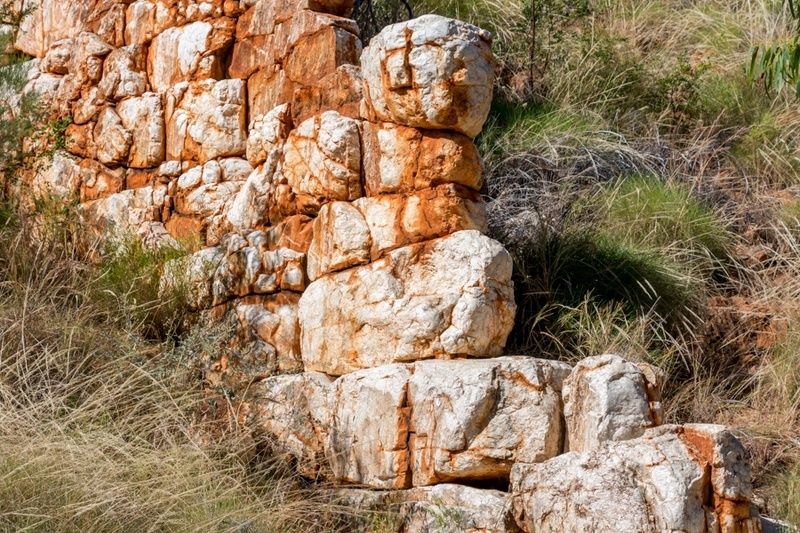 This wall, completely natural, stretches for several kilometers and reaches a height of 6 meters. 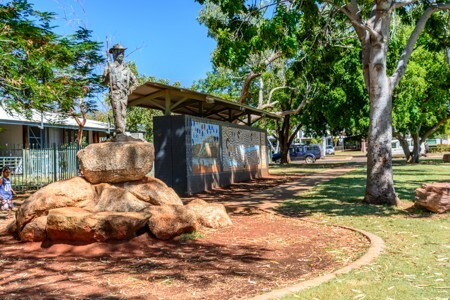 The town of Halls Creek is one of the few inhabited places of the Kimberly region and has little more than 1,000 inhabitants. 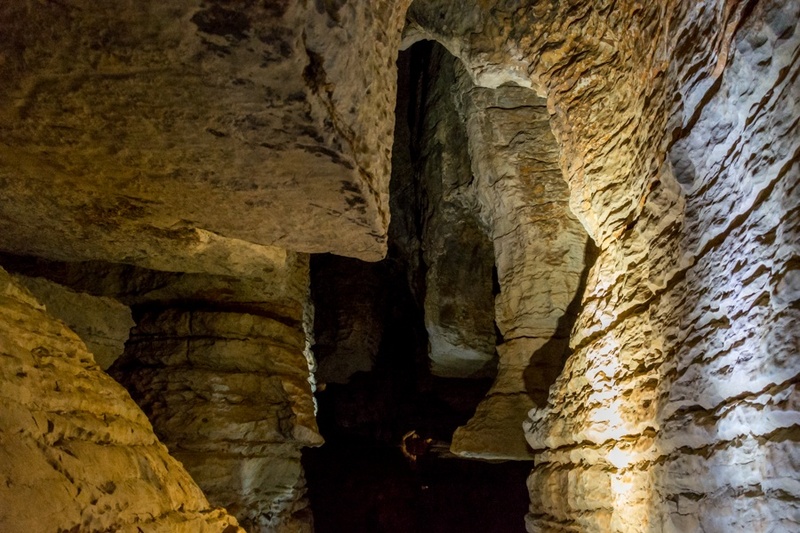 It was founded towards the end of the nineteenth century to support nearby mines of gold and other minerals, which were quickly exhausted. Later, Halls Creek became a commercial center and a large open-air farm (known in Australia as "cattle station"). The typical Kimberly landscape with streams, water ponds and wild horses grazing in Savannah. 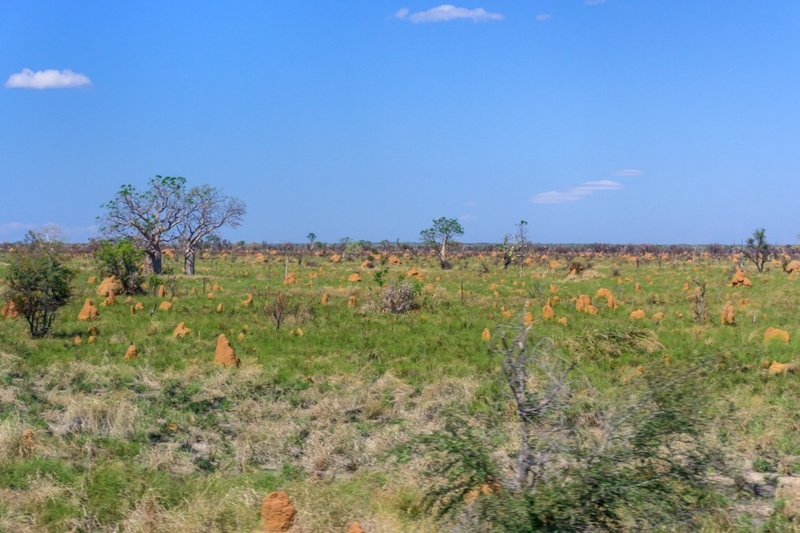 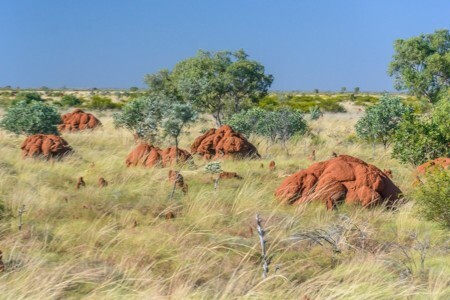 The termite-mounds, becoming an integral part of the landscape in Australia. In the picture on the right, a dead termite mound, which can be recognized for the surface no longer undergoing maintenance and showing what were once the inner rooms. Building a termite-mound is relatively fast and the structures can grow for several centimeters per year (part of the structure is however under ground). 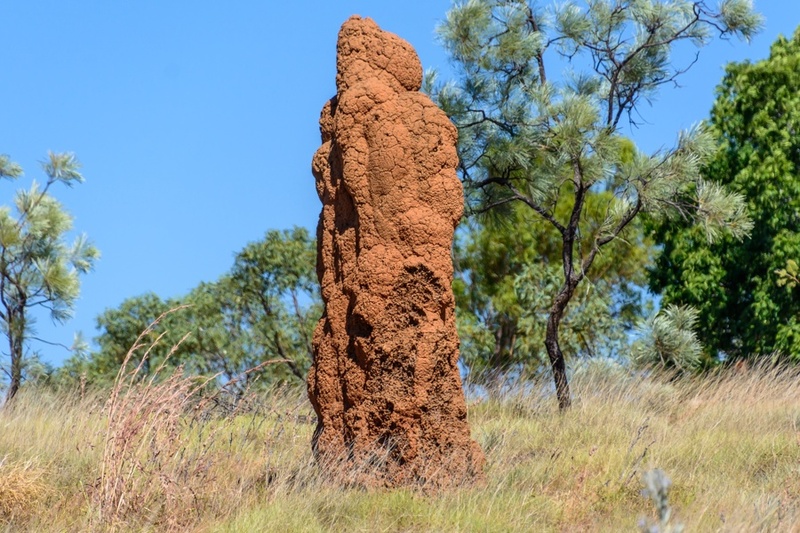 They are fire resistant and can remain in operation for many decades, as the termites repair damages to the surface constantly. 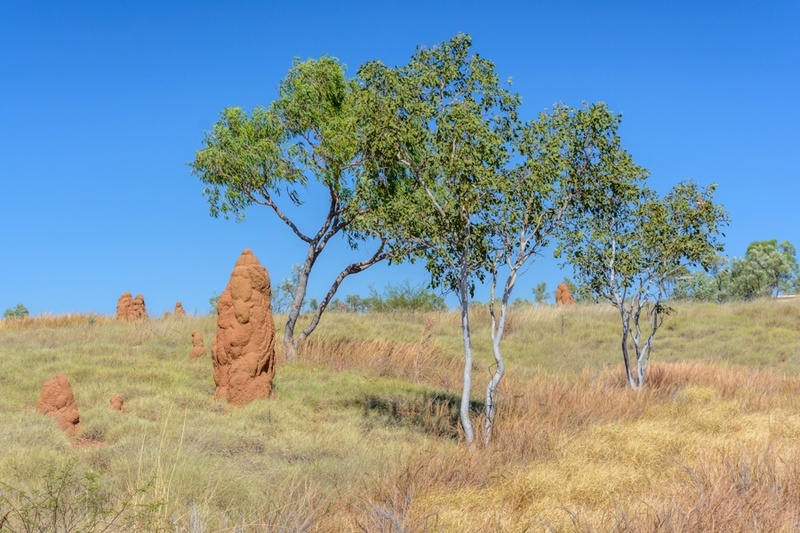 The termites feed mainly on grass and do not pose any danger to wooden artifacts or buildings. 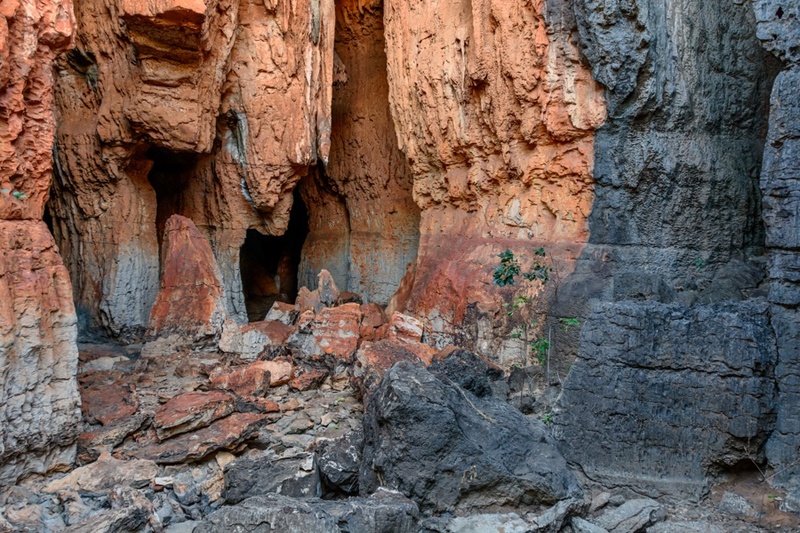 The exterior of Mimbi Caves, located about an hour drive east of Fitzroy Crossing, offer a stunning glimpse into the Devonian coral reef dated back to nearly 400 million years ago, which was once part of the ocean's floor. 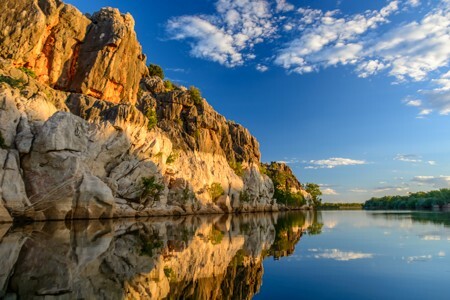 It is quite strange to see these cliffs here, hundreds of kilometers away from the nearest sea and in the center of a continent. 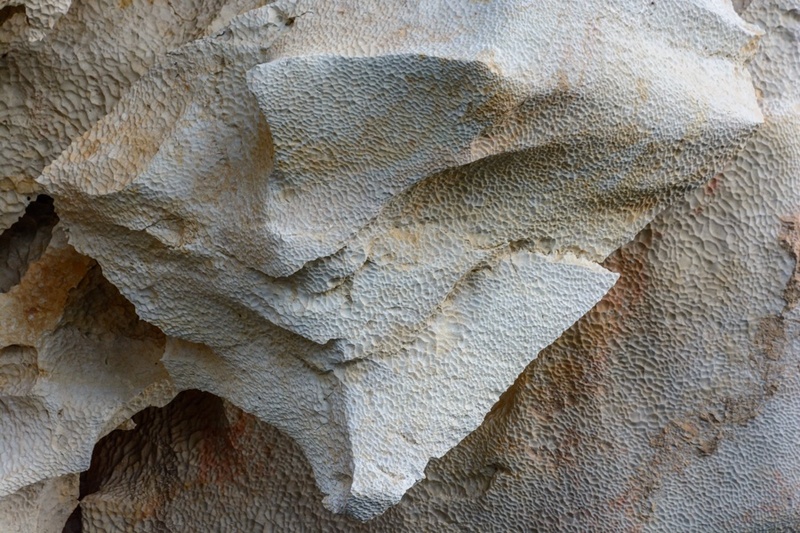 The coral rock that makes up the Mimbi Caves. 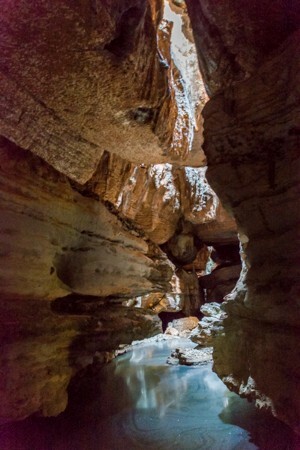 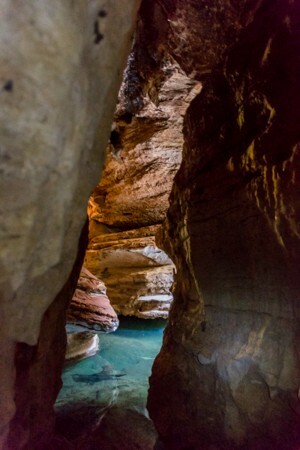 The Mimbi Caves have a dense labyrinth of canyons that can only be explored together with an authorized aboriginal guide. 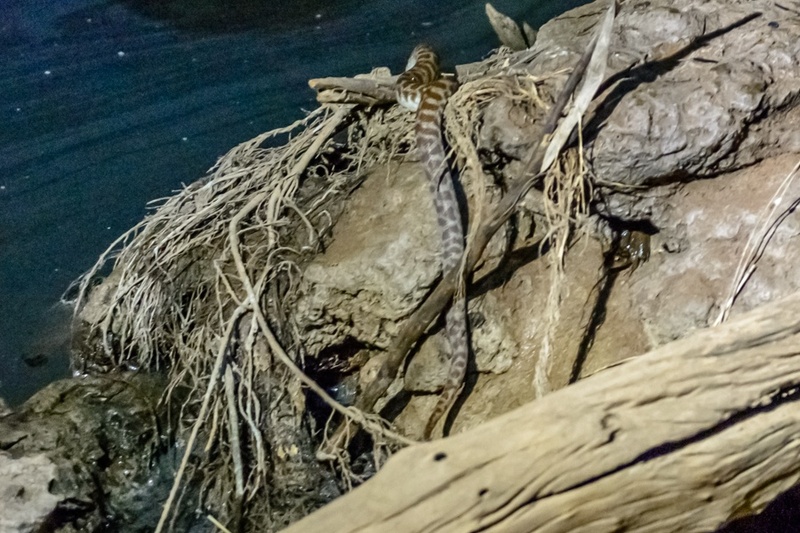 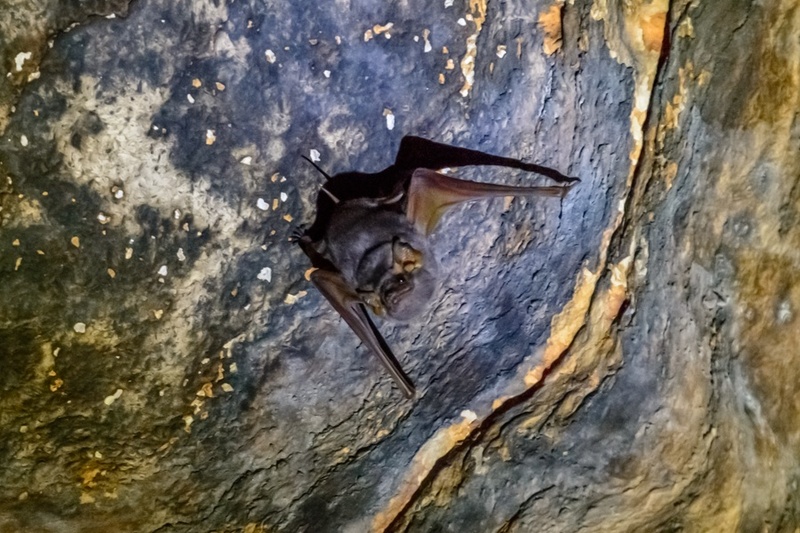 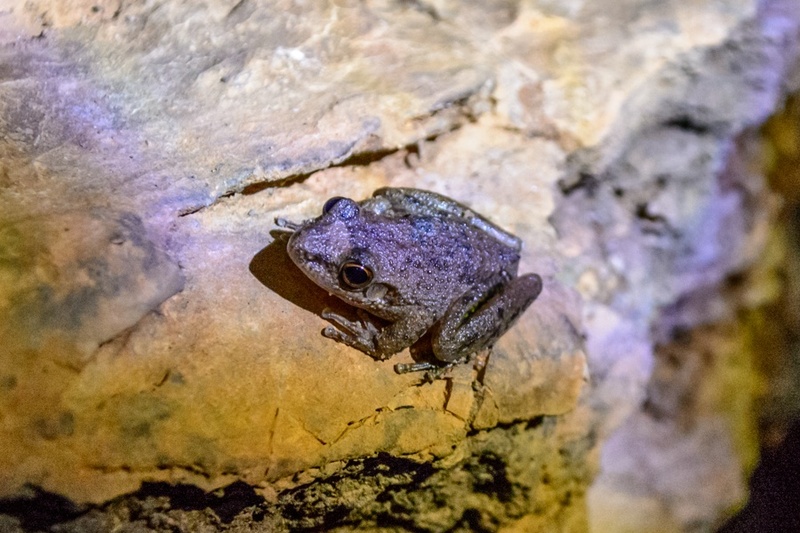 Mimbi Caves host frogs, snakes and many bats. 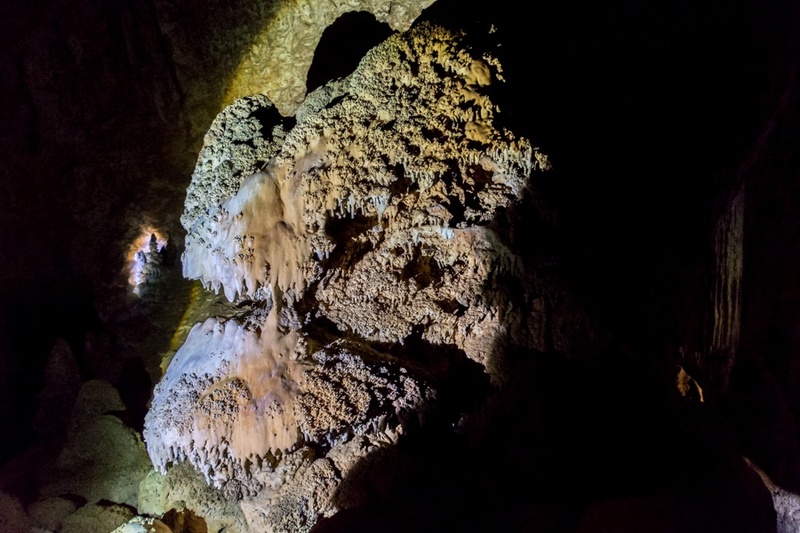 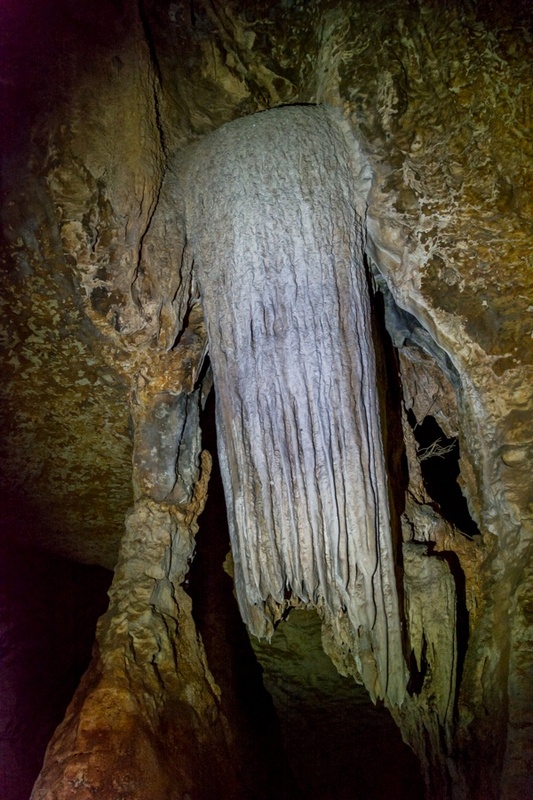 Inside the Mimbi Caves it is not uncommon to find stalactite formations of significant size. 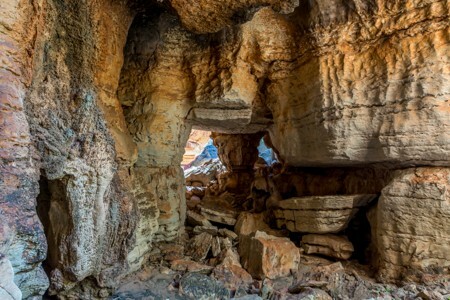 The interior of the Mimbi caves in Australia, among multicolored coral rocks and formations created by the accumulation of minerals. 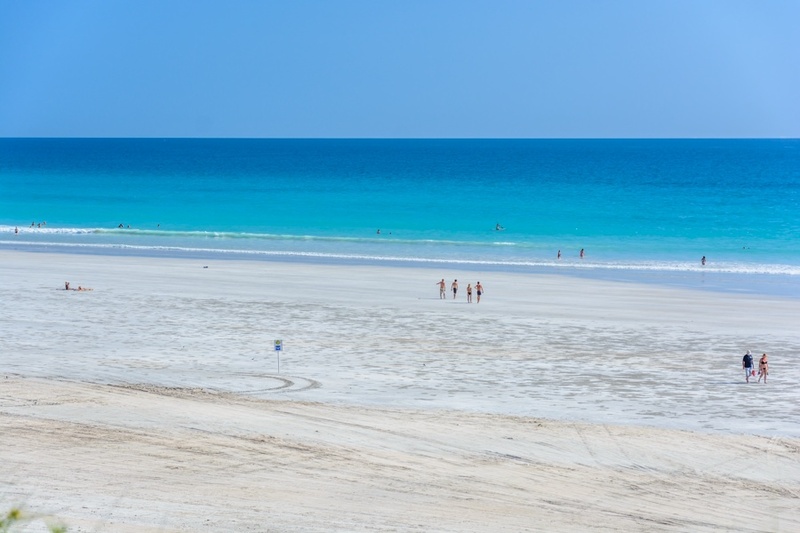 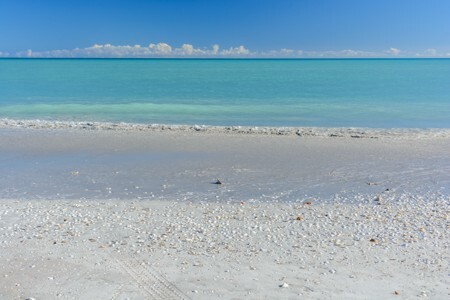 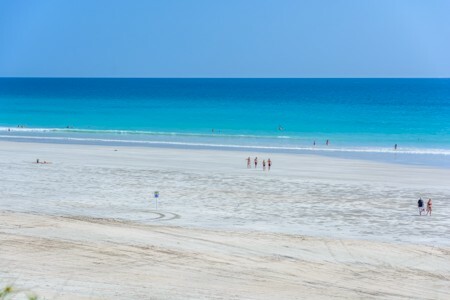 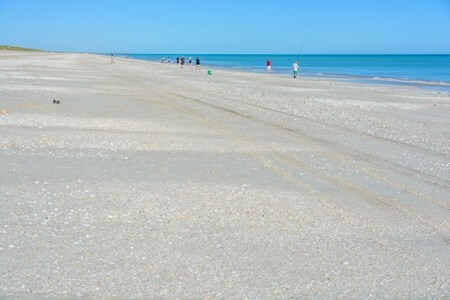 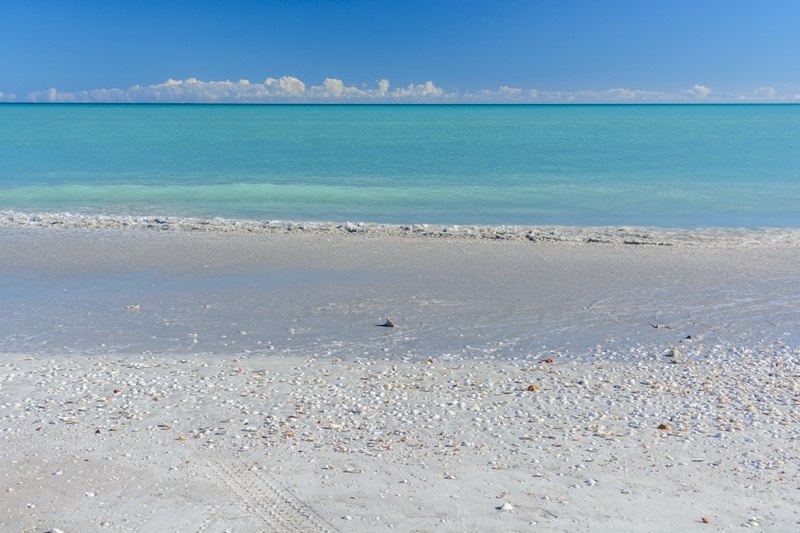 The Indian Ocean shores in the Kimberly region are surrounded by dozens of wide white beaches, such as the beautiful Cable Beach in Broome.